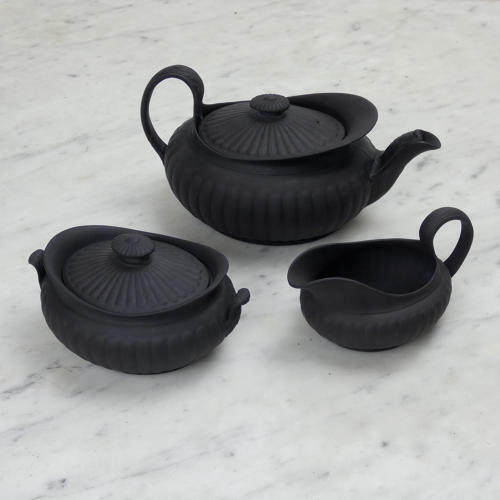 A three piece, basalt tea service comprising a teapot, milk jug and sucrier. Each piece is marked 'WEDGWOOD' and there is also an impressed 'O' to each item, which would be a workman's mark. The service dates from c.1860. Size: The teapot is 21.5cm. (8 1/2in) long by 12cm. (4 3/4in) wide by 11.5cm. (4 1/2in) high, the sucrier is 14.3cm. (5 5/8in) long by 10.5cm. (4 1/8in) wide by 8.3cm. (3 1/4in) high and the jug is 13cm. (5 1/8in) long by 8cm. (3 1/8in) wide by 7.5cm. (3in) high. Each piece is moulded with a simple, fluted design and has foliate terminals on the handles. The shapes are very elegant. This design was one which appeared first in Wedgwood's catalogues in the late 18th century but continued in production through the 19th century and into the start of the 20th century. Throughout this time the quality varies considerably. This set is lightly potted but the moulding is not quite as crisp as the earlier examples. It is all in excellent condition. Price includes postage within the U.K. and Western Europe. Shipping to the U.S.A. add £15.